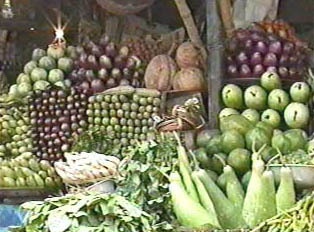 Supermarkets have the usual array of fresh produce and fish, meat and chicken. Local and imported frozen and canned foods are also for sale. Many people do all of their shopping at supermarkets to avoid having to barter at the open markets. Open markets offer a fine array of fresh produce and meat, chicken and fish. Markets open early in the morning and run until the end of the day, with the exception of prayer time on Fridays from 12:00 to 1:00 p.m.. When one shops at the open market, one should do so before noon while the wares are fresh. An unusual feature of markets in Bangladesh is that a shopper can literally shop from the car. As one drives through the market, vendors will come to the car, making it possible to barter and buy food from the car window. When buying chicken, meat or fish, one can always have the merchandise cut, cleaned and prepared to order. Bread is not sold at the markets but rather at convenience stores or the supermarket. Convenience stores sell staples ranging from dairy products to bread, cereals, paper goods, rice, sugar and tea. Often, one can tell a convenience store by the small toys hanging as decoration in the windows. Convenience stores are also advertised as “General Stores” and can be found on most city streets. In the country, all food is purchased either at the open markets or in very tiny convenience stores that sell only the essential staples of rice, milk and bread.